Parker working at her home in Athens. All photos by Nik Nerburn. Mariah Parker doesn’t slow down. When I chatted with her at the end of February, she’d just finished a big show as the hip-hop opener for the alt-country band, Drive-By Truckers. She was prepping for SXSW (after her 2018 performanceNPR and The New York Times pegged her as an artist to watch) while working on her second album. She’s getting her PhD in Linguistics—she attributes it to her love of words—at the University of Georgia while teaching three courses, studying for her comprehensive exams this spring, and writing a book chapter for her dissertation. And every Tuesday night she sits behind the rail in city hall as the youngest county commissioner for Athens-Clarke County, Georgia. Parker, who performs as her alter ego Linqua Franqa, is one of the buzziest female rappers in the South. She’s not your typical politician. But she’s aiming to change that. At just 26 years old when she was elected, Parker became a flashpoint in the 2018 election cycle when she took her oath of office last summer. “Athens, Georgia isn’t a blip on anyone’s map,” she says, “so I made decisions on how I wanted to make my public service oath to the people in Athens who’d been forgotten.” These decisions included standing on the front steps of city hall—the ceremony usually happens inside the chamber—with her left hand on the The Autobiography of Malcolm X. She wore a pink t-shirt that showed off the tattoo on her right arm: a sprig of lavender with the words “No enemy but apathy” written beneath it, which she says is her campaign motto. But Parker didn’t expect these decisions to make waves beyond her constituents. “When that’s a radical thing to do in 2018, we’re in big trouble,” she says of the media storm that followed. 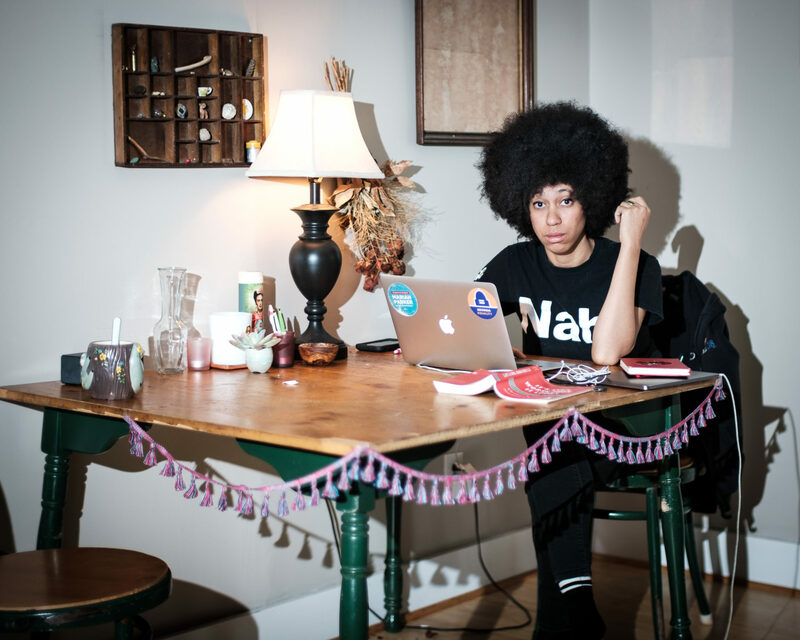 But for fellow commissioner Melissa Link, Parker’s persona as both a politician and an artist is important: “She’s a young, queer, African American woman who wears her hair in an afro and dresses casually. She’s one of the people, and we need to see more regular people as our leaders,” says Link. Parker, who grew up outside Louisville, Kentucky, used to struggle with her identity. She felt too Black for the white kids and too white for the Black kids. “Being ping ponged between these two worlds took a toll on me as a young person,” Parker reflects. When she moved to North Carolina for college in 2009, she expressed her frustrations through slam poetry and rap battles, but she never thought performing hip hop would be her future. But since moving to Athens almost five years ago, Parker has become one of the region’s leading hip hop artists. While it sounds like a long time coming, Parker describes it as spontaneous. Following a break up in early 2017, she decided to cure heartache by booking her first music show. She spent two months writing songs jangling around her head since high school. Her live set became her first album, Model Minority, arcing from a dark place of depression, suicide attempts, drug abuse, abortion, and anxiety, into empowerment and agency. By the end of the record, she’s riding her gold bike into a place of self love and social action. Although it came from a place of extreme vulnerability—she had to re-record the album because of how “terrified, embarrassed, and ashamed” her voice sounded the first time—she started connecting with fans who shared similar experiences. Mariah Parker is the youngest commissioner of Athens-Clarke County, Georgia. Hip-hop helped morph Parker into a leader. She spent a few months as campaign manager for Tommy Valentine, a fellow hip-hop artist, before Valentine convinced her to enter the race herself. Her district had been under the same leader for almost 25 years, who had run largely uncontested. Even though Parker felt inexperienced, she wanted to see a more active democracy in her community and she wanted to give her constituents an option. Even if she lost, she hoped herplatform—which included marijuana decriminalization, affordable and accessible public transportation, and a living wage—might reinvigorate public debate. They ran in neighboring districts, and while he lost his campaign, she was elected by just 13 votes. For Parker, the work of making local government a more inclusive space doesn’t end with her election. She wants to use her story to encourage more musicians and young people to get involved. She believes they’re the experts for their communities, and they can use their stories to create change. Just after her election, Parker performed in city hall. She stood in front of a portrait wall of former local officials who are overwhelmingly white, male, and aged. Then she launches into her feminist rap “11 Names.” Parker has a lot to say, and for once, these men have to listen.